I am an academic, a member of Divisions 17, 45, and 51, and an Asian American counseling psychologist who cares deeply about using our science and our understanding of our communities to promote justice and well-being. I have been training graduate students on the importance of producing and translating knowledge that may influence practice and policy. We have discussions about the importance of keeping an eye on public policy, which has the potential to shape, exacerbate or address disparities in health outcomes and access to services. Access to care and prevention are two main issues I address with my students when discussing disparities facing people of color. My students and I have discussions about the importance of rigorous research and going upstream to promote psychological health and prevent distress. I talk to my own students about reaching out to lawmakers and school board members. I even talk to them about having their elevator pitch on the importance of psychology ready. Advocacy is an important activity for psychologists. I am not one to typically write blogs but I jumped at the chance to do so when the invitation from the Education Directorate came to chronicle my experience at the 2015 Education Leadership Conference (ELC). This was my first ELC – a 3+ day conference. The presentations on the utility of theory as well as the translation of psychological science to practice in education settings was informative. This conference was more than that. We talked with colleagues from across the country about the state of psychological science and received updates on the effects of the Budget Control Act on graduate students in psychology. We heard impactful stories from graduate students about their experience of the sky-rocketing costs to education – exacerbated by the elimination of access to subsidized loans for graduate students. I came away from these discussions thinking about how unsubsidized student loans for graduate education has the real potential for limiting access to graduate psychology programs and may ultimately hurt our field’s ability to grow the supply of mental health professionals and keep up with the growing demand for psychologists. 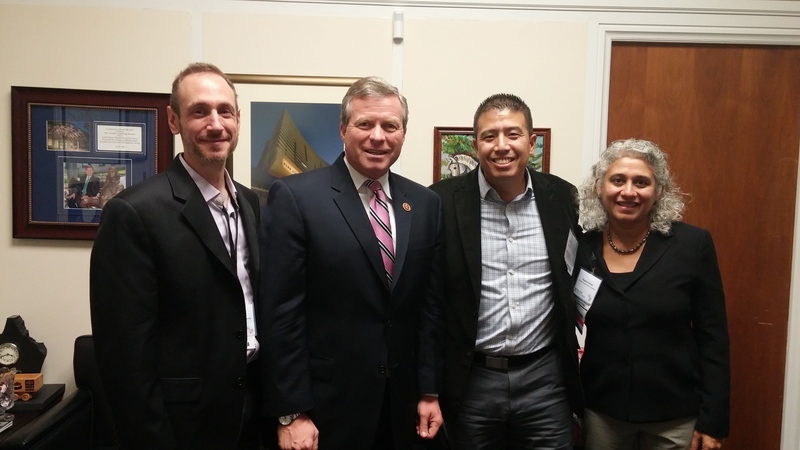 From the left: Evan Forman, PhD; Rep. Charlie Dent; Christopher Liang, PhD; Arpana Inman, PhD. As a final act, we were given the opportunity to go to Capitol Hill. Given that this experience of going to the Hill was on my bucket list, I was very much looking forward to this the entire weekend. The danger of high expectations has the likelihood of being letdown. This was not the case here. The ELC challenged assumptions that individuals may have of partisan politics, provided the scaffolding necessary for us to grow in our skills and confidence to deliver our pitch, and allowed those of who were new to the conference to receive valuable feedback and encouragement from those who had done it before. We were given data and arguments to deliver our extended elevator pitch. Some of us wanted more data and more arguments but a former US Representative emphasized the importance of speaking in the language of our audience, particularly through the use of stories. With a night of rest and armed with data and stories, we were grouped with colleagues by state and sent off to discuss the need to restore graduate student access to the federal subsidized loan program with congressional staffers, Senators, and Representatives. As a counseling psychologist trained in scientist-practitioner model, I understand the benefits of both quantitative and qualitative data but somehow I needed this experience to remind me of the importance of a single story in the work of advocacy. These stories shed light on the impact of problems in ways that quantitative data alone cannot. using rich stories to help to illustrate points when engaging in advocacy. I encourage you to reach out to your local and state leadership about issues the field of psychology is facing, specially those pertaining to the cost of education. To find out more information about HOW TO TAKE ACTION, CLICK HERE. Chris is an associate professor of counseling psychology at Lehigh University. He is a former President of the Society for the Psychological Study of Men and Masculinity (Division 51). His research interests center on how perceived racism and masculinity ideologies are associated with the academic, psychological, and physiological health, and health-related behaviors of ethnic minority boys and men. Chris also examines the role of coping, psychological rumination, just world beliefs in the associations between perceived racism and health outcomes for Asian Americans and Latina/o Americans. The purpose of his research lines is to determine effective individual-level, systems-level, and policy-oriented interventions. For instance, Chris has worked with school districts, Universities, Departments of Health and Human Services, as well as not-for-profit community organizations to strengthen their capacity to serve diverse children, youth, and families. Chris currently serves on the Editorial Board of The Counseling Psychologist and the Psychology of Men and Masculinity. He coauthored the book, Handbook of Multicultural Measures and co-edited the upcoming text, Contextualizing the Costs of Racism for People of Color. 5 Reasons Psychologists Don’t Advocate and Why You Should! APA’s Introductory Psychology Initiative will provide recommendations for how the course is taught, how teachers can be trained, and how student learning can be assessed. Join the effort. Take the APA IPI Census.